Friday August 1, marked opening of Free, the last exhibition at Gaspard, which has made its home on South Division Avenue for the past two years. 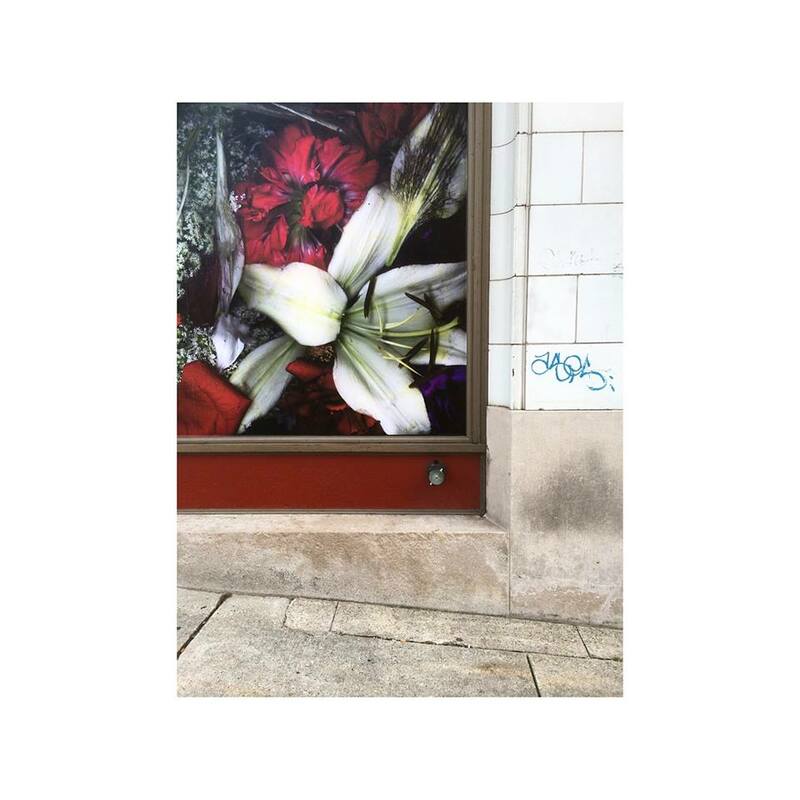 An advantage of a storefront gallery is that the work is always visible, but the windows are currently completely covered with an opaque floral composition by Cox. Apparently comprised of flower shop standards (lilies, carnations, roses), this could easily be saccharine, particularly since its printed on adhesive vinyl (grazie 40 Visuals), but Cox navigates around anything so hackneyed. The flowers were scanned, so they appear pressed and bruised, against an inky background. The work recalls 17th century still-life paintings, which would often include insects gnawing at the fruit or petals, serving to remind the viewer of the brevity of life and inevitability of change. Cox’s baroque floral is in sharp contrast to the works inside the gallery. Jacob Bullard‘s contribution is a photograph of an unassuming fragment of roadside landscape, the sort that exists at the periphery of human activity. The other selections more clearly suggest change. Jeff Kraus‘ gestural painting sprawls off unstretched canvas onto the wall, and dribbles down onto an arrangement of planks placed parallel with those of the floor. Cox’s suspended composition in the middle of the gallery includes the bench that had been a feature in the space, with a stacked arrangement of industrial felt, proofs from the publication Beholder (? ), and a piece of styrofoam, serving as an improvised receptacle for red paint. The tidy arrangement of materials associated with packaging, and suspension allude to cleaning and packing, tasks involved in preparation for moving. Cox’s wall/floor installation, on the other hand, suggests the inherently violent nature of restoration or renovation. Two pieces of timber anchored at the floor with concrete blocks and tethered with wire, pierce the wall in two tidy rectangular openings that seem like surgical wounds. Given that it’s the last exhibition in this space, there’s any number of interpretations for the title. Perhaps the collective was making a statement about the ubiquitous “art martyr” phenomenon implicit in Saltz’ statement, wherein considerable work is invested in such an undertaking, with no likelihood of financial gain, and little recognition. Free may suggest relief at the prospect of being released from the endeavor, or anticipation for the future. Admittedly, not all the exhibitions were extraordinary; the group exhibits were uneven, individuals within their coterie were becoming too frequent staples, and there was the challenge of actually seeing the work. Absent any fixed hours of operation, interested parties had to either make an appointment, attend the opening reception, or be satisfied with peering into the gallery through the windows. None of that mattered much, because the gallery filled a gap in the patchy art scene within Grand Rapids. Gaspard was a highly visible and polished presence, featuring artwork that would not readily find a venue elsewhere in the city. Its a civil break-up, but it still hurts.